In less than a week's time, California will be able to proudly boast hosting two outdoor hockey games in less than 13 months and drawing more than 100,000 fans to the spectacle known as the Stadium Series. Conversely, Minnesota, a land promoted as the State of Hockey, has yet to host one of the NHL's signature events. Don't feel bad for people living in the land of 1,000 lakes, though. While they may not have the sun-drenched skies that often serve as the back drop for glorious views here in the Golden State, Minnesota school kids and their North Dakota neighbors do hold at least one distinction over West Coast natives, many literally grow up on the pond. Prior to being selected by Los Angeles at the 2012 NHL Draft, the Minnesota native was playing for the Lincoln Stars in the USHL. And although he won’t be suiting up for the Kings when they take on the Sharks at Levi’s Stadium this weekend, he is one of the team’s three prospects to play in recent outdoor games. One of his biggest concerns leading up to the event was the weather. “The game was in Omaha, so I was wondering how things were going to play out,” said the 22-year-old. “It could be either 60 degrees in February, or 15 degrees. I also wondered about the atmosphere, like, would there be a sold out crowd?" Jordan Weal, another of the Kings draft picks to have played outdoors, was likewise thinking about the weather prior to his participation in the WHL’s game between his Regina Pats and host Calgary Flames, played the day after the NHL’s 2011 Heritage Classic featuring the Canadiens and Flames. One of the more notable aspects of the latter contest was its ability to add to the Pats’ lengthy history. Already one of the most storied franchises in all of junior hockey, the game became the latest tale in their nearly 100-year journey. At the time, Weal said he was “hoping for minus-20 and a blizzard, so it's just a grind fest out there. That would be fun." With snow on the ground and frigid temperatures, it likely worked out even better than he could have hoped. Not surprisingly, Weal, who averaged more than 100 points over his final three years in Regina, managed to find his way on to the scoresheet that night via an assist on the team’s second goal. They went on to win the game 3-2 in front of more than 20,000 fans at McMahon Stadium, setting a junior hockey attendance record. As time passes, players tend to remain like wide-eyed youngsters prior to Christmas morning when discussing their outdoor experiences. Through it all, fun and excitement seem to be two of the thoughts that come up most often when they reflect on lacing up the skates for those contests. Just like the Kings and Sharks will take to the Northern California ice a day early for practice, this trio of NHL hopefuls also participated in an outdoor practice with their respective clubs in the days leading up to the actual games, and each say it was nearly overwhelming. “Going out there, everybody was in awe, just seeing it in person for the first time,” LaDue described, as if it was yesterday. “We had a great time out on the ice and it was so much fun, a real blast. Everybody was skating a little harder that day in practice, for sure. We were really looking forward to putting on a great show in front of a large crowd and taking on one of our big rivals." That rivalry element was also a key factor to Wisconsin’s game at Soldier Field. For the first year pro, that game will always hold a special place in his heart because of his ties to the Chicago area. 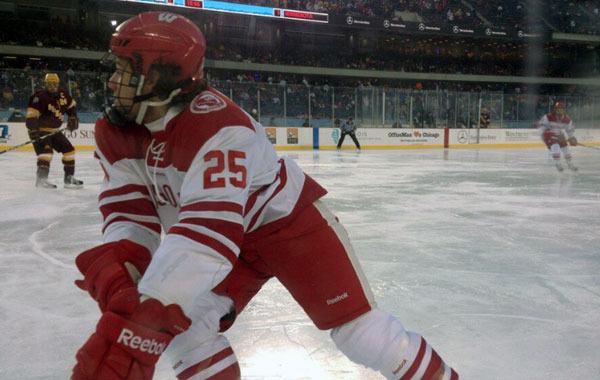 To this day, hockey outdoors just feels right for Mersch. 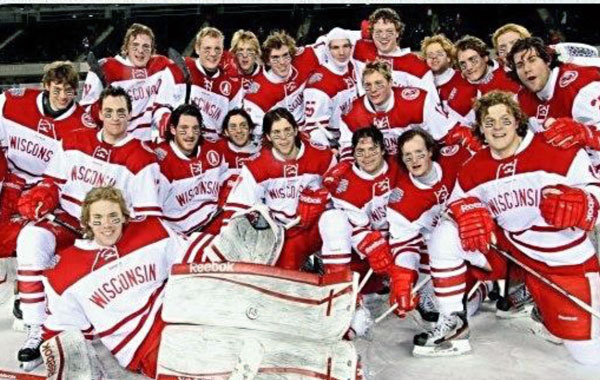 Mersch’s Badgers came away winners that day – “Being able to play there in front of all my family was great. Winning in front of them was even better,” he said. It’s the one thrill LaDue didn’t get to experience when he played outdoors; his Stars fell to the Lancers 4-2. Even so, he has an ear to ear smile when retracing the steps of the entire experience. How much did the game mean to him? He bought his own jersey from the team and it proudly hangs on the wall of his dorm at North Dakota. “We had custom jerseys made for that game. It was pretty special to play outdoors and it was a cool uniform, so I wanted mine. Playing outdoors took me back to my youth, just with pads and some hitting," he said with a little laugh. John Hoven is the founder and editor of MayorsManor.com - previously named Best Hockey Blog by Yahoo Sports and the Best Sports Blog by LA Weekly. As a past member of the Professional Hockey Writer's Association, Hoven has voted on the top NHL Awards. He has been active over the years on the NHL Radio Network, where he co-hosts the West Coast Bias show, and on Twitter as well (@MayorNHL).